Rainy Day Thoughts: Part II, Diane Widler Wenzel on How I Hang the Pictures I Paint. 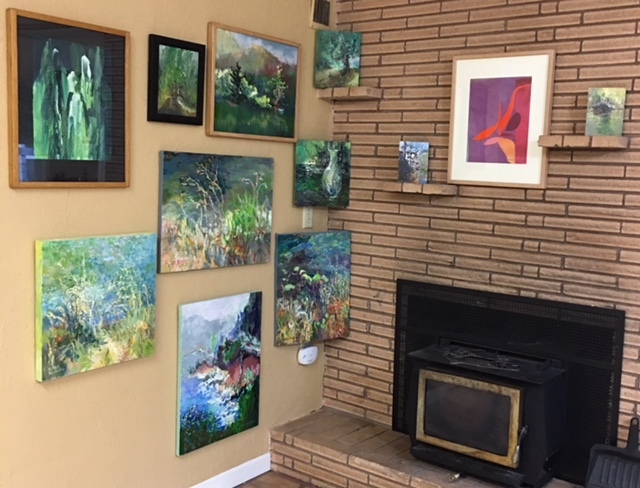 Part II, Diane Widler Wenzel on How I Hang the Pictures I Paint. I couldn't be happier with last Sunday's lunch with visiting family to celebrate 120 paintings hung at home and then the public art opening at Albany Public Library's main branch. A sister-in-law commented, " I could hang way more paintings than I ever thought I could. " upon seeing how I hang groupings between large empty spaces. One of my daughters wanted a grouping of 3 paintings from the corner fireplace installation in the dining area. The home celebration and reception made me feel loved by my supportive family and friends. Part II of how I hang paintings continues with examples of how empty spaces around the paintings are important to their effect on us. Also covered are my experiments in hanging solutions in the dining area and the entry from the kitchen to the laundry room. 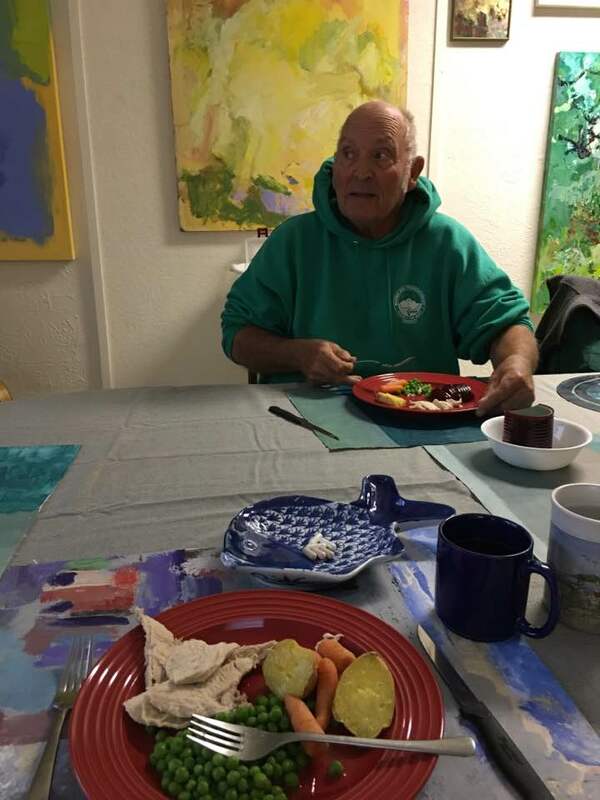 Below is Don eating and a panoramic view of the green paintings that he sees from his side of the table. I selected for him green, his favorite color. Green is clean looking and soothing. Walls of three entries frame paintings. From the front door the eye is apt to look beyond on into the dining area with busy activity and also paintings. From the kitchen entry to the dinette the view includes empty wall space. The hall from the back of the house. The cool colored green paintings and white matt make the warm colored collage dominate the grouping. The collage is suppose to be the first thing seen. Then looking at the collage the eye is directed leftward by a shape pointing to the warmer colors in the green paintings, thus the eye moves around this grouping. The green vertical painting with a black matt counterbalances the warm collage. For me this group works. I hope that it works for others. Purhaps the reason Don slows down as he eats is because he has some greens around him. To frame or not or hang out from a corner? Two of the paintings and the collage are framed with oak frames made by my fantastic partner, Don. The paintings that are unframed work better in a grouping? Or do these frames isolate them acting as obstacles preventing the eye from moving from painting to painting? I feel none of my groupings have to be perfect because my hangings are works in progress. I am learning and do not know all of the answers. I like to ask, "what if," as I decide the next grouping. 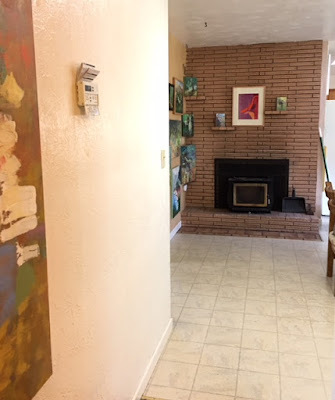 An innovation for me is to draw attention to corner paintings by hanging them so the sides are on opposite walls. The kiddy corner arrangement makes them more dominant especially when walking down the hall from the back of our house. From down the hall the left side wall is at too much of an angle to see what is happening in the paintings hung flat to the wall. Corner paintings work less like windows on the wall and more like a three dimentional architectural fixture that I have difficultyillustrating in a two dimentional picture. For the coldest wintery nights we remove paintings close to the fire box and keep a fire burning. Paintings are clutter busting by creating distance in tiny laundry / fly tying / utility room. In this cluttered place I see the painting before the clutter. How about you? After adding a painting with deeper dark green depth to the wall behind the sink, there is a greater sense of depth. I feel less cramped. Because of the humidity of the laundry room I do not leave pictures here for long periods especially during the winter. Rotating paintings is a favorite way to get inspired for making more paintings. Some of the ones I will be rotating are stored in my studio. 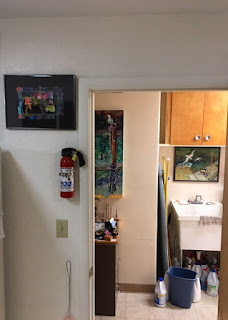 I will show my studio with storage cabinets in the next blog, Part III, How I Hang the Pictures I Paint. I always like seeing your work and interesting how you think when hanging the paintings to suit who will see it. Rain, yes I now think about what is in my husband's view as he moves differently than I do through our home. Also think of what he needs in relaxation and favored subject matter. Attending to our different needs for enjoyment, mood support and tastes as an attainable goal is a new idea for me.